Making its Las Vegas debut as a stand-alone brand, Terex Trucks ups the ante at CONEXPO-CON/AGG (March 7-11) with the launch of the GEN10: THE NEW STANDARD. Terex Trucks will deal a strong hand at CONEXPO-CON/AGG when it unveils the new standard in articulated haulers. The Scotland-based manufacturer is delighted to announce it will offer customers in the US and Canada three years of full machine warranty, three years planned maintenance, and three years telematics as standard! Available with Terex Trucks’ line of Generation 10 articulated haulers, the brand new initiative is the first of its kind for the manufacturer, and a further commitment and testament of its belief in the reliability and quality of its products. Taking up residency outside in the Gold Lot, booth G3987, Terex Trucks’ exhibit will set the brand apart from its rivals as it also launches its two years or 6,000 hours warranty on all Factory-Approved parts. With complete confidence in its build quality and performance promises, Terex Trucks understands the significant investment clients make when buying and maintaining their machines and is committed to offering the very best aftermarket support to ensure customers can maximize operational output. Tried and tested to perform in the most grueling environments, the manufacturer’s parts are beyond comparison and are available globally. Terex Trucks’ CONEXPO-CON/AGG offering will be fronted by the show-stopping Generation 10 TA400, a Tier-4 Final emissions legislation compliant hauler that offers durability and quality to ensure that customers benefit from lower operating costs and increased performance – even in the toughest of terrains. 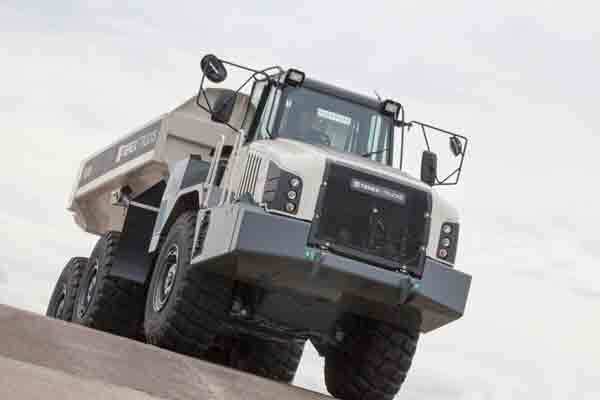 The 41-ton capacity articulated hauler is also the first product to be launched by Terex Trucks since its acquisition by Volvo Construction Equipment. Made in Motherwell, the Gen10 TA400, which is the largest in Terex Trucks’ articulated hauler family, features upgraded hydraulic and electrical interfaces, new drop box, improved aesthetics and telematics in an effort to maximize the uptime of the dump truck. Also taking to the spotlight at CONEXPO-CON/AGG – and with a payload weighing in at a heavyweight 60-ton – will be Terex Trucks’ proven performer, the robust TR60. The versatile rigid dump truck is purpose-built to haul through arduous environments and carry more materials in less time, with less fuss. Fitted with the Cummins six cylinder 19-litre engine, the TR60’s drivetrain gear reduction provides excellent rimpull, powering the rigid hauler up the steepest of gradients, while a high capacity haul body makes for low retention carry-back and cleaner dumping. A popular model, the TR60 offers solid performance in a wide range of hauling applications – from mining sites to large construction and earthmoving projects. Terex Trucks will be at CONEXPO-CON/AGG in Gold Lot in booth G3987, from March 7-11. Product specialists and senior managers will be available in the booth to demonstrate how the company has strengthened its dealer network, increased the worldwide availability of parts, and enhanced its products and customer service solutions. There will also be a fun area on the stand where visitors will have the chance to guide a remote-controlled hauler around an assault course. There will be a prize at the end of each day for the person with the quickest time.